Are you afraid your tears of grief will never end? The only solution for ending the tears is to reconnect and stay connected to your loved ones in spirit, which Dr. Turndorf is devoted to helping you do! The “Love Never Dies” show is based on Dr. Turndorf’s number one international bestseller, Love Never Dies: How to Reconnect and Make Peace with the Deceased. For two-years, the “Love Never Dies” show had been the most listened to hour on the Hay House network, surpassing the programs of today’s top spiritual giants such as Wayne Dyer, James Van Praagh and Carolyn Myss. Tune-in to “Love Never Dies” and discover for yourself why reconnecting and Dialoguing with Your Departed loved ones is the only way to dry your tears and transform your grief to joy! For more information about Dr. Turndorf follow her on Facebook: askdrlove and Twitter: @askdrlove and visit www.askdrlove.com. Are you carrying a grudge toward someone? Tune in to discover the secret perk that keeps us holding onto our grudges. And find out how to finally set yourself free from the grip of grudges. As always, I look forward to speaking with you during the live show. Description: Love is an everlasting emotion you can take with you… and it can bring our deceased loved ones back to share important life-saving information. Absolute Love Heals Absolutely! Our Sacred Dream Doors are portals to the Divine where Healing Visitations can take place. Love is the key. 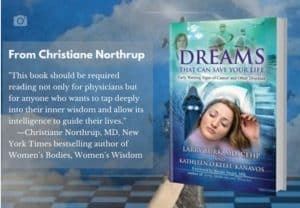 Three-time Breast Cancer Survivor Kathleen (Kat) O’Keefe-Kanavos shares her own true stories of incredible Dream Visitations by deceased loved ones, and those of the Dreaming Authors in her book, that saved lives and were validated by medical pathology reports. Bio: Kathleen (Kat) O’Keefe-Kanavos believes your dreams can diagnose and save your life. Did you have a déjà vu or a dream come true? Kat was born to a military family, raised in Europe, graduated from Munich International High School in Germany, has a degree in Special Education from Keene Teacher’s College in Keene, NH, taught Special Education for 10 years and Psychology at the University of South Florida. She is a three-time breast cancer survivor whose dreams diagnosed her illness and saved her life as seen on NBC & CBS News, the Dr.Oz and the DOCTORS Show. Her second book Dreams That Can Save Your Life: Early Warning Signs of Cancer and Other Diseases, published and distributed by Inner Traditions/Simon & Schuster, is co-authored with Duke University Radiologist Dr. Larry Burk, and contributing author Dr. Bernie Siegel. It is based on Dr. Burk’s groundbreaking study of 18 women whose dreams diagnosed their breast cancer which was later validated by pathology reports. Kat was one of Dr. Burk’s study subjects. Kat is a Keynote Speaker and presents at the International Association for the Study of Dreams aka IASD. She’s a TV Producer/Host of Wicked Housewives On Cape Cod™ TV/Radio and Author/Lecturer of the International bestselling and multi-award-winning book, Surviving Cancerland: Intuitive Aspects of Healing which promotes patient advocacy and connecting with inner guidance through dreams, prayers and meditations, for success in health, wealth, and relationships. Known to millions as “Dr. Love,” having founded AskDrLove.com, the web’s first relationship advice site since 1995, Dr. Jamie Turndorf has been seen on numerous TV shows and is the “go to” relationship expert on CNN, CBS, VHI, WebMD and MSNBC where she’s been delighting audiences for three decades with her engaging blend of professional expertise, spicy humor and remarkable ability to turn clinical psychobabble into easy-to-understand concepts that transform lives. Dr. Turndorf offers live and virtual small group 4-hour Love Never Dies Retreats at her home during which she personally helps each participant to reconnect, dialogue and heal unfinished business with loved ones in spirit. In addition, Dr. Turndorf also offers her 8-week Love Never Dies Online Course. Her 8 recorded video lessons, bonus audios and recorded group calls, guide students to reconnect, dialogue and heal unfinished business with loved ones in spirit. Dr. Turndorf also personally trains and certifies coaches in her Trans-Dimensional Grief Method. If you feel called to help others reconnect and heal unfinished business with loved ones in spirit, click here to apply for a seat in her coach certification class. 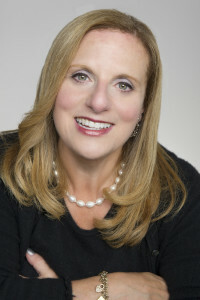 For more information about Dr. Turndorf follow her on Facebook: askdrlove and Twitter: @askdrlove and visit www.askdrlove.com.